When Walid Amed Ali stands beside the only window in his tiny office, he looks out on an almost perfect world on the Kenyan island of Lamu where his family has lived for generations. His view is of a tranquil sea, boats bobbing in the breeze as fishermen back from pre-dawn catches serve waiting customers while women in black buibuis or shawls, men in long white kanzu robes, and donkeys bussle along the seafront. Lamu with its narrow, winding streets and stone buildings, is the oldest and best-preserved Swahili settlement in East Africa and a United Nations World Heritage Site, attracting pilgrims annually to celebrate Prophet Mohammed’s birthday. But life in the town founded in 1370 is about to change as the government plans to build East Africa’s first coal-fired power plant, a 1,000 megawatt (MW) facility 20 kms (12 miles) north on an agricultural 869 acre site in Kwasasi. The $2 billion plant is part of a plan to more than double Kenya’s electricity generating capacity to about 6,700 MW by 2017, providing power for industries and much needed jobs in a country where one in five young people are unemployed. However the project has divided communities and environmentalists fear the plant will destroy the marine environment of Lamu region, a coastal area near Somalia that has been hit several times by al Shabaab Islamist militants. The battle over the plant highlights a challenge of governments across the region which are seeking to beat poverty by investing in major infrastructure projects, only to face complaints from citizens about a lack of consultation and other issues. But it is a different story in Kwasasi village where smallholder farmers cultivate cashew nuts and coconut trees. There are no roads, public transport, schools or hospitals and access is mostly by motorbike but there is an abundance of wildlife including hippos, buffalo and zebra. “This coal plant can be a blessing,” said farmer Simon Gathoni, peeping out from under a red baseball cap, his hands ghostly grey from tilling his land. About 400 families in Kwasasi have been promised $8,000 per acre by the government for their land, said Gathoni. He has been waiting two years for $32,000 compensation for his four-acre plot – a huge sum for a farmer who earns around $2,000 a year. Gathoni said he plans to buy another plot of land for himself, wife and two children in an area with better services. “I’ll be able to settle somewhere less wild, somewhere where my children will not have to walk for hours to school,” he said. Grace Nyambura, who works as a casual labourer for Amu Power Company which will run the plant, said everyone in Kwasasi wants the project. Amu Power is backed by a consortium that includes East Africa’s leading investment company Centum Investments and a group of Chinese companies. Work on the plant, that will take an estimated 30 months to build, was due to start in December 2015 but Kenya’s energy industry regulator has delayed issuing a licence due to environmental concerns..
Nyambura, a mother of four, stopped farming her land two years ago when the government offered to buy it. “There was no point in planting and labouring over crops that you would abandon later,” she said, surrounded by abandoned homesteads and neglected farms. Residents are also now demanding $15,000 per acre although the National Land Commission, which is overseeing the process, said it will not increase its offer and Nyambura and Gathoni, like many Kenyans do not have title deeds to their land. Ibrahim Mwathane, chairman of the Nairobi-based Land Development and Governance Institute said the lack of titles could “lead to a long compensation process”. Nyambura blames campaigners opposing the plant for delays. Around the bay, residents of Lamu town want a fight. “We’re not anti-development but no one in the world has ventured into coal mining and faced no long term consequences,” said Ishaq Abubakar of the Lamu Youth Alliance. They fear the coal plant will pollute the sea, killing marine life, coral reefs and mangroves that locals depend on. “Our whole life revolves around water,” said fisherman Abdurahman Ali worried over his livelihood. Tourism is the other mainstay of the economy, with visitors enjoying Lamu’s pristine white beaches and annual festivals. “If anything changes and the tourism numbers are affected, the island will die,” said Francis Dyer, chairman of the Lamu Tourism Association, in emailed comments. Amu Power Company said nothing of the sort will happen. “We are adhering to the highest standards,” said Said Bajaber, Amu Power’s project development executive, pointing to the company’s multi-volume environmental impact assessment. 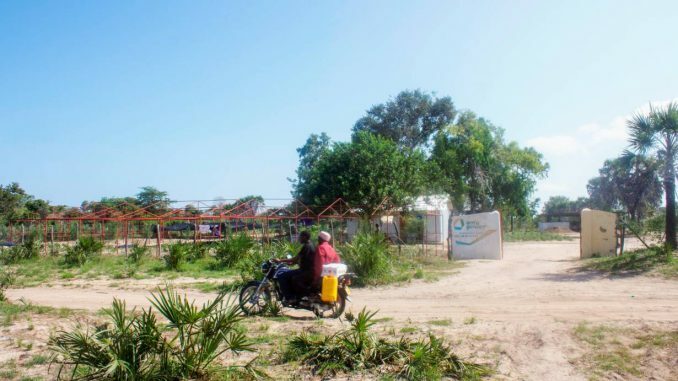 Local environmental group Save Lamu believes Kwasasi landowners have been blinded by the huge sums on offer while other residents say the project was fast-tracked and approved without adequate consultation – a claim the government denies. Despite Save Lamu filing a last ditch legal bid to halt the project in Kenya’s National Environment Tribunal in November, Amu Power still hopes to start work in March. “All members were given time to respond,” said Evans Nyabuto, spokesman for the National Environment Management Authority which gave the green light to the project.